A beloved holiday tradition celebrating its 96th year running, the lighting will be held Nov. 28 at the Ellipse at President's Park at the White House. WASHINGTON — Holiday revelers have until Monday at 10 a.m. for a chance to score tickets to this D.C. tradition. The National Christmas Tree Lighting is on Nov. 28, and you need a ticket to attend. Tickets are free but are only given out through a lottery. To enter, get on the National Park Service’s Recreation.gov website or by calling 877-444-6777. Winners will be notified Oct. 29. A beloved holiday tradition celebrating its 96th year, the National Christmas Tree Lighting Ceremony will be held at the Ellipse at President’s Park at the White House, the park service said in a statement. The Christmas tree is a Colorado blue spruce from Virginia, and it lives in the park year-round — usually without so many lights and decorations, but it welcomes visitors no matter the season. The lighting event will include live musical performances, and in addition to the main tree, there will also be 56 smaller trees, each decorated with ornaments to represent every U.S. state and territory as well as the District. 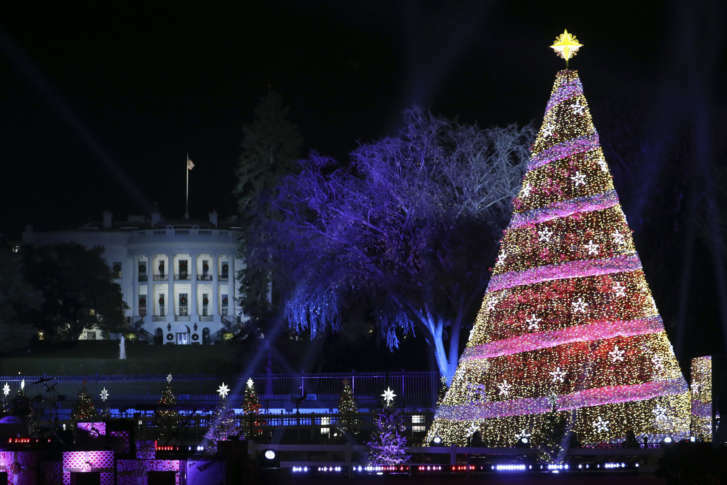 The park service said the National Christmas Tree Lighting Ceremony was first celebrated by President Calvin Coolidge in 1923, a decade before the park service started caring for the White House grounds.